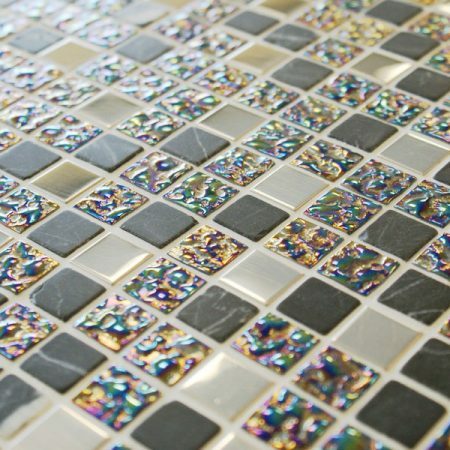 Imagine a wall where marbled stone, mirrored glass and rippled iridescent mosaic tiles mingle to bring brilliance to your interiors. The Lustre collection is a creation of captivating beauty. It features the perfect mix of surfaces, shades, tones and textures to create a wall of mosaics which begs to be touched. 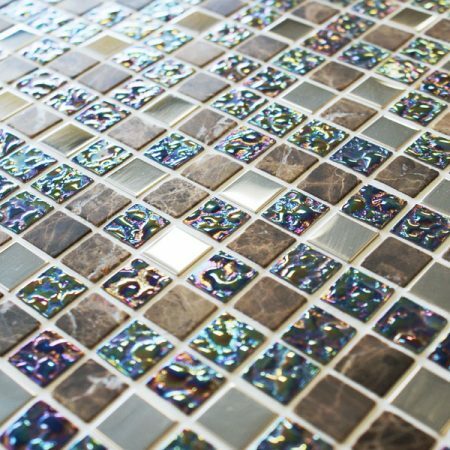 Lustre gives you two sophisticated colourways to select from; Lustre Brown stars stone-coloured marble and brown-toned iridescent mosaics, and Lustre Grey features rich lustrous mosaics in dark tones and grey-coloured marble. Add Lustre to bathrooms, kitchens, hallways or any room in your home where you want to enliven and invigorate your walls. It’s simple to bring Lustre to life; every tile is supplied on an easy-to-apply mesh backing so you can transform a run of the mill wall into a scene of splendour with the minimum of fuss. Lustre – designed to delight, invite and add shimmering light.